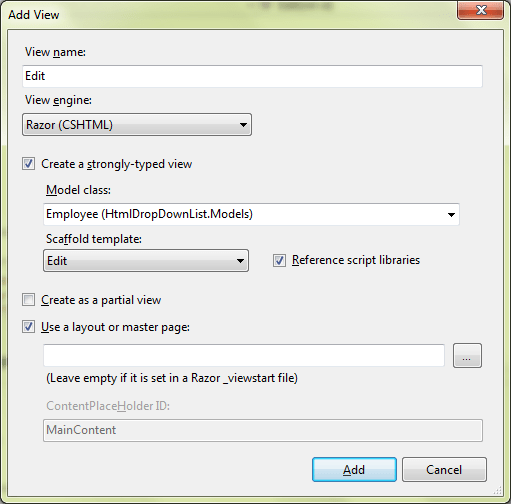 Html.DropDownList is used when you need to create a view that has a dropdown that allows you to select one of several possible values for one of your model’s properties. For example you have a Model that describes a Employee. One Employee has one Manager and in the Employee’s Edit view you want to display a drop down with all the possible values for Manager. For the sake of simplicity all values are hardcoded. 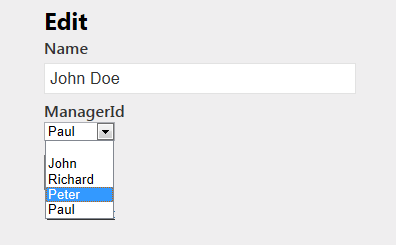 Not what we want, but it is very easy to change, just change the EditorFor( mode=> model.ManagerId) to @Html.DropDownList(“ManagerId”, string.Empty) and you are done. It will generate an html select element with a name attribute value of “ManagerId”. This is important because MVC’s model binder will look inside the post data for elements with the same name as the properties in the model, in this case Employee. Because Employee has a ManagerId property and the post data contains an element with that name the model binder will fill it as we intend. The string.Empty is a value that is added to the beginning of the list. Think of it as representing that the employee does not have a manager. Remember that ManagerId in the ViewBag contains a SelectList the was initialized with all the managers, one optional value and a selected value. The selected value will not work (won’t be selected) if your DropDownList’s name is the same as the model property (see http://stackoverflow.com/questions/624828/asp-net-mvc-html-dropdownlist-selectedvalue). I don’t really know why this happens (if you find out please let me know).